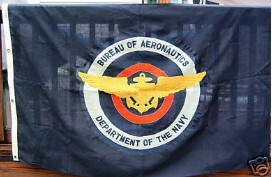 This obsolete flag is described in an Ebay posting as "a wool bunting flag measuring approximately 44 x 66 inches and double sided, with applied logo, of the Bureau of Aeronautics with embroidered highlights. The flag was made prior to 1959 and is since long obsolete. "The Bureau of Aeronautics was formed in 1921 and in 1959 was merged with the U S Navy Bureau of Ordnance and became the Bureau of Naval Weapons. Hence this flag was obsolete in 1959. And this bureau became Naval Air Systems Command In 1966."